For months now there's been speculation about Rob "Hyper" Sharpe's secret past. Why does the likeable firefighter turn cagey when questions about his lovelife arise? And why is he never ready to talk in detail about his social life? Despite his secrecy, no-one is expecting the skeleton that leaps from his closet in this week's London's Burning. Having spent the day rehearsing a fire safety play, later in the mess. Hyper reveals that he is gay. The news leaves his Bluewatch collegues reeling. Some think it's a joke, some accept it, while others react badly. "There has been a lot of pressure and Poison Pearce has been snooping around," says actor Connor Byrne who plays him. "It looks like everyone's going to find out, so Hyper decides to tell them over a meal." Connor, 36, knew when he joined the series that his character was going to be gay and asked the Fire Brigade Union's Gay and Lesbian Support Group for advice. 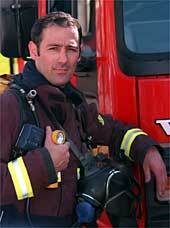 "The Fire Brigade is one of the best public employers in terms of policies when it comes to homosexuality," he says. "They don't care as long as you can put out a fire"
Connor wanted to portray what he considered to be a large, under-represented section of gay men. "There are huge numbers of gays who don't mince around like screaming queens. Like Hyper, they are just men whose sexual preferences are different. Hyper is a lad who happens to be gay. So what? But what you can't overlook is that in the Fire Brigade you have to get on. It's like a family. So as the others react is very important to Hyper. The gay fire officer I spoke to said his brigade was very suppoertive when he came out," says Connor. "But in this job, you are dealing with death, which puts things like sexuality into perspective." Connor is full of admiration for real life firefighters and loves being part of Bluewatch. The only downside is he doesn't get to spend as much time with his daughter, Mimi, who will be two in June. "My wife Becky is an actress and we both reckon its almost certain that our daughter will follow in our footsteps. She's already a little star. She's actually made her first TV appearance when she was just eight days old in Birds of a Feather. I had a part in the last ever episode and they needed a new born baby, so I took Mimi in. But just to make sure that acting really is in her blood we've given her the perfect actress name - Me Me!"